With the Boston Celtics 2012-2013 season opening next Tuesday, October 30th, against the reigning NBA Champion Miami Heat, it’s safe to assume most are excited about the season’s start. But this post is not about a start, rather a tale of Celtics great Paul Pierce’ career coming to a close. And it will be sooner than you think. At 35-years-old and coming back from a sprained MCL from last year’s playoffs, Pierce will likely have one last season (this year) left in the tank. With that said, Pierce would be wise to hang it up after this season. Granted, this is just a prediction, as Pierce is under contract with the Celtics through the 2013-2014 season. I’m curious though, what do the fans think? Will Pierce retire one year early or will the “The Truth” be set free when his contract expires? Comment in the section below. This entry was posted in Celtics and tagged celtics, John Havlicek, Miami Heat, nba, paul pierce by tsmithbsb29. Bookmark the permalink. I doubt he retires. He does have an option in his contract (which he already told NESN he intends to play out fully). The only way he does retire is if somehow KG opts out of his contract or he gets injured real bad. He deserves more than anyone to retire with the C’s but it won’t happen just yet. Even if Green becomes good enough to start, Paul Pierce could win 6th man of the year award and has more experience than anyone on our team other than KG. They Didnt it make it to the finals in 09. They lost to the lakers in 2010. My apologies on the statistical error. Won’t happen again. Completely forgot the Lakers beat the Orlando Magic in 09′. Thanks for catching it. I hope you enjoyed the post. 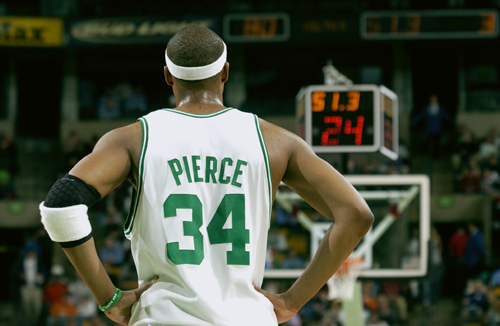 I personally hope Pierce plays out his contract and retires in a C’s uniform.